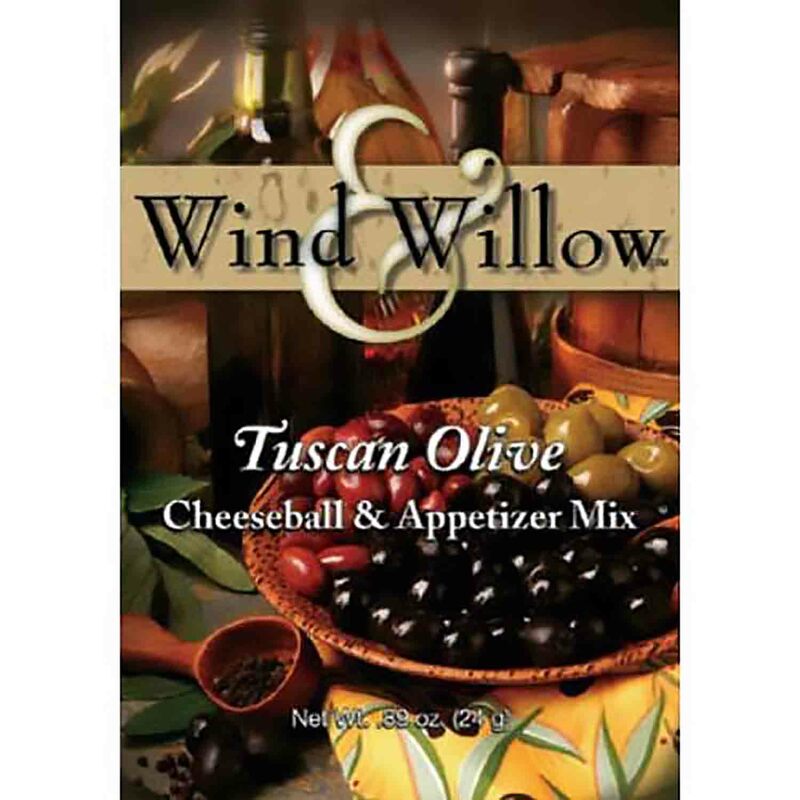 Brand: Wind & Willow WW-33104 Units: 1 mix From Wind and Willow company. Make up this beautifully packaged and delicious mix. Just add 8 oz. cream cheese and 4 tablespoons butter. Serve on graham crackers, fruit, bagels, etc. Also included is a recipe for Tuscan Style Cheese Bread. Besides the mix you will need: French or Italian bread, butter and cream cheese. From Wind and Willow company. Make up this beautifully packaged and delicious mix. Just add 8 oz. cream cheese and 4 tablespoons butter. Serve on graham crackers, fruit, bagels, etc. Also included is a recipe for Tuscan Style Cheese Bread. Besides the mix you will need: French or Italian bread, butter and cream cheese. Ingredients: Cheeseball: Maltodextrin, Dehydrated Tomato and Balck Olives, Salt, Whey, Dehydrated Garlic, Natural Flavors (Balsamic Vinegar, Modified Corn Starch, Molasses, Caramel Color), Hydrolyzed Corn, Soy, Wheat Protein (Sugar, Onion Powder, Beef Extract, Lactic Acid), Spices, Autolyzed Yeast Extract, Parmesan Cheese Powder (Cheese, Partially Skim Milk, Cultures, Salt, Enzymes, Disodium Phosphate), Malt Powder, Sodium Diacetate, Citric Acid, Dextrose, Disodium Inosinate, Disodium Guanylate, Lactose, Sodium Citrate. Topping: Dehydrated Garlic, Onion, Tomato, Maltodextrin, Spices, Partially Hydrogenated Soybean Oil, Whey, Natural Flavor, Hydrolyzed Corn, Soy, Wheat Protein, Parmesan Cheese Powder, Dehydrated Black Olives, Autolyzed Yeast Extract, Malt Powder, Sodium Diacetate, Citric Acid, Lactose. Contains Soy, Wheat, Milk.